a. Service Only Boxing – Upon receipt of the England Boxing Certificate from the Coaches’ Representative, photocopy the certificate, complete Individual Registration Application (Annex E to Section 4) and forward, together with a UK cheque (and £5 for service boxing) Central Bank Army Sports Control Board and a printout demonstrating a pass at MATT 3 Battle Casualty Drills Training Level 2 to the address shown on Annex E.
b. Civilian Boxing – Upon receipt of the England Boxing Certificate from the Coaches’ Representative, candidates should log in to the England Boxing Website www.englandboxinginsight.com and follow the prompts to register (all applicants must ensure that the card used for payment is registered to the same address as they give for the registration application). Individuals will then need to photocopy the certificate, complete Individual Registration Application (Annex E to Section 4) and a printout demonstrating a pass at MATT 3 Battle Casualty Drills Training Level 2 to the address shown on Annex E. Applicants will be required to apply for Disclosure and Barring Service clearance (see Section 4 para 6). All England Boxing registered coaches are required to undertake a SAFEGUARDING WORKSHOP before the commencement of the 2017 /18 Season. a. Service Only Boxing – Complete Individual Registration Application (Annex E to Section 4) and forward, together with a UK cheque (and £5 for service boxing) Central Bank Army Sports Control Board with a printout demonstrating a pass at MATT 3 Battle Casualty Drills Training Level 2 together with your Registration Book to the address shown on Annex E.
b. 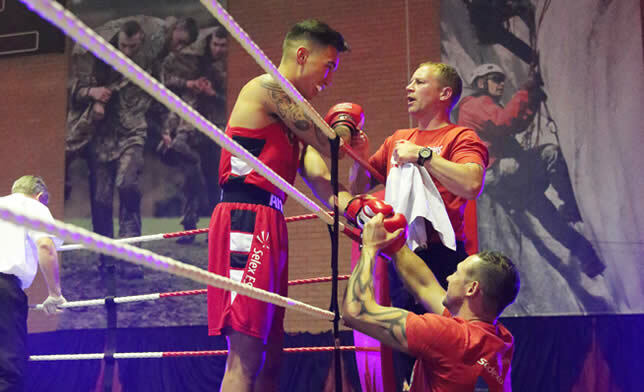 Civilian Boxing – Candidates should log in to the England Boxing Website https://www.englandboxinginsight.com and follow the prompts to register (all applicants must ensure that the card used for payment is registered to the same address as they give for the registration application). Individuals will then need mail their current Registration Book along with a completed Individual Registration Application (Annex E to Section 4) and a printout demonstrating a pass at MATT 3 Battle Casualty Drills Training Level 2 to the address shown on Annex E. Applicants will require an in date certificate of Disclosure and Barring Service clearance (see Section 4 para 6), and as at July 2017 proof of attendance at a Safeguarding Workshop. 12. Coaching outside of the expiry date of the sticker is not permitted. Coaches are responsible for the safekeeping and updating of their registration books. Coaches not in possession of valid ENGLAND BOXING registration are not permitted to participate in any activity (coaching, seconding, handing up, etc) when civilian boxers are involved.